When perched resembles stocky version of male Pied or male Eastern Pied (capistrata race). 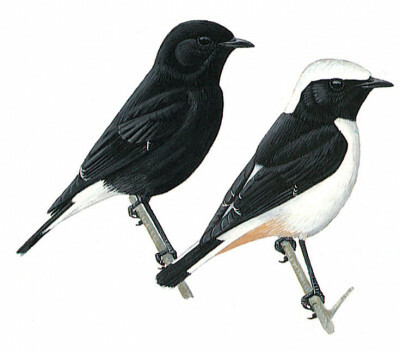 Readily identified from both in flight by prominent whitish panel in open wing; compared with Pied the black ‘bib’ is smaller, underparts white (tinged buff in Pied) and undertail-coverts rufous-buff; also primary coverts narrowly tipped white and black band near tip of tail is of fairly even width without the pronounced upward black extension on outer tail-feathers of Pied. In autumn lacks the pronounced pale feather fringes to black throat and mantle of male Pied. Juvenile lacks black mantle and throat, has blackish ear-coverts, a broad buffish white bar to greater coverts and to tips of otherwise black primary-coverts.